Entertainment is alive and well with Betsoft, Microgaming and Nextgen! Introducing the stories of royalty, love, wealth and tantalizing dishes in these next 5 games from Microgaming, Nextgen and Betsoft. 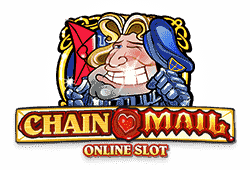 Microgaming presents the 5-reel and 20 fixed paylines slot called Chain Mail with an exceptionally large and kingly prize of 120,000! The royalty-themed slot has four higher-paying regular symbols: a mobile-carrying Princess, handsome Knight, white mare and red letter box. The Chain Mail logo wild with x2 multiplier substitutes for any other symbol except the scatter and rewards up to 100, 750, 7,500 or 50,000 when 2, 3, 4 or 5 form a payline. The Bonus Gate scatter in sets of 3, 4 or 5 will instantly provide you with a top-up of up to 500, 2,000 or 10,000 respectively. When the Castle Bonus is triggered, you can open doors to find 10 free spins with x2 multipliers, the princess with a prize equal to the total of all prizes on that level, a random prize or the angry king who ends the bonus. 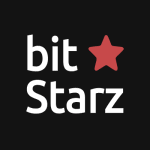 Play Chain Mail Bitcoin slot for free. The Doctor is in the house with Doctor Love from NextGen Gaming with a heart racing prize of up to 5,000 coins on an active payline! Doctor Love is played on 5 ivory-coloured reels and 1 to 20 variable. Visit this doctor and you’ll instantly fall in love with the highest paying red-headed bombshell. She is followed by the bandaged patient, blue teddy bear, an ambulance, a bouquet of flowers, a pocket watch, patient chart, crutches, a stethoscope and water cup with heart-shaped pills. The Doctor Love wild can substitute for any symbol except the Love Meter and also form his own win line with 2, 10, 200, 1,000 or 5,000 coins. The love meter scatter appears on any space with 2, 3, 4 or 5 crediting you with 2, 4, 15 or 100 coins. 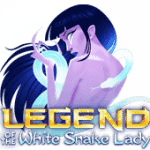 Land 3, 4 or 5 scatters for 10, 15 or 20 free spins that can be re-triggered, with 3x multiplier. The colour or suit gamble feature offers a 50-50 or 1 in 4 chance to double or quadruple your winnings. 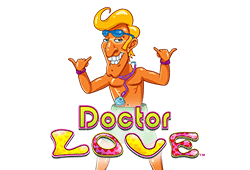 Play Doctor Love Bitcoin slot for free. 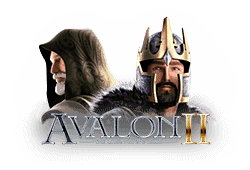 Avalon II, from MicroGaming, takes you on an epic journey through the Kingdom of Avalon as part of a quest to find the lost Grail and bring it home. 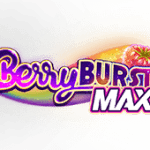 Along the way, in this 5-reel and 243 ways-to-win slot, destiny may lead you to encounter 8 bonus games culminating in up to 120,000! The superb graphics illustrate the story with characters acting as higher-value symbols that include Arthur, Merlin, Morgan and the Black Knight. The Lady of the Lake symbol is an expanding wild that only appears on the 3rd reel and can substitute for all but the Grail scatter. With 2, 3, 4 or 5 Grail scatters, you can collect up to 7.50, 37.50, 150 or 750. 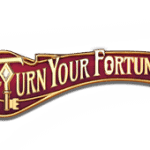 Three or more will commence the Grail Bonus Game which is a journey through the enchanted Kingdom where your quest is to recover the Grail and you can collect up to eight bonus games when you choose your path. 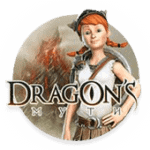 They are the following: Lake of Legend Bonus Game, Misty Vale Bonus Game, Whispering Woods Bonus Game, Forest Falls Bonus Game, Dusky Moors Bonus Game, Morgan’s Keep Bonus Game, Hall of Shadows Bonus Game and Isle of Avalon Bonus Game. 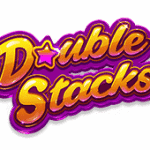 These games will either award you with multipliers, free spins or bonus cash. Play Avalon II Bitcoin slot for free. Betsoft opens its vaults containing 4 progressive jackpots, with 5 reels and 10 fixed paylines, called Reels of Wealth that pays both left to right and right to left. Amongst the symbols there is the chest of treasure, sack of jewels/coins, piles of money, a red diamond, a blue diamond and green diamond. The vault scatter symbol may appear on any space and quantities of 1 to 15 credit you with as little as x1 to as much as x2,000 your line bet. There is a wild with a x2 multiplier. It replaces any symbol except the scatter and MegaStar symbol. On each win, the Rolling Wins feature awards a free re-spin. 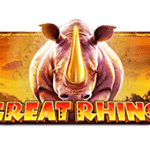 If you achieve 3 consecutive re-spins then you’ll receive the standard reward, the 5th to 7th spins grant you a x2 multiplier, and 8+ grant you x3 multiplier on winnings. 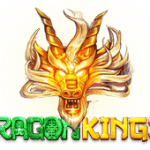 The MegaStar Jackpot scatter will award 10, 15 or 25 free spins with 3, 4 or 5 symbols, where you can potentially unlock one of four progressive jackpots: MegaStar Jackpot, Legend Jackpot, Star Jackpot or Hero Jackpot. The MegaStar Bonus scatter can award coins in numbers of 4, 10, 30, 100 or 500 with 1, 2, 3, 4 or 5 symbols on any position. 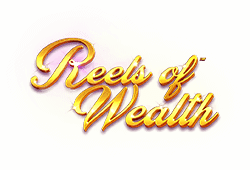 Play Reels of Wealth Bitcoin slot for free. 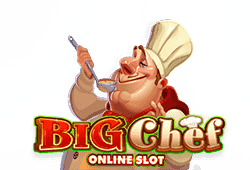 Microgaming is cooking up some great things with their 5-reel and 15 fixed paylines slot Big Chef, where you can get served delectable prize dishes of up to 75,000! That’s because the lowest paying symbols include a sweet dessert, tomato soup, moist turkey, juicy steak and tantalizing lobster dish. Of course a restaurant is nothing without its staff, so representing the higher-paying symbols are the young busboy, refined waiter, pretty chef’s assistant and the master-chef himself! The slot dishes up a wild where 3, 4 or 5 form a payline of up to 75, 500 or 2,500. Like in restaurants, this slot has a menu that acts as a scatter symbol with 2, 3, 4 or 5 on any space crediting up to 7.50, 37.50, 150 or 750. 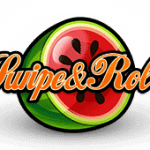 If three or more land on the reels, 10 free spins are awarded with x2 multipliers. 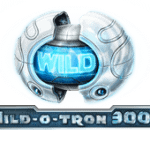 In addition to the wild, there is also the Rising Wilds during free spins, where wilds that land on the reels elevate to the top row leaving a trail of wilds. The base game also serves up a free spin with the cloche scatter appearing on the 5th reel. Wilds appearing will become rising wilds. Play Big Chef Bitcoin slot for free.